A remarkable general and capable president, Washington's legacy in American history remains profound. More than two centuries after his death, commemorations to the First President of the United States of America can still be found all over the world. George Washington was born on February 22, 1732, in Westmoreland County, Virginia, to a Colonial Virginian family. His family was of English gentry-class descent, and his father, a tobacco planter, died when he was only eleven years old. After his father's death, George's older brother, Lawrence Washington, became a father figure for him. The death of his father prevented Washington from receiving an education at England's Appleby School, where his older brothers had attended. He instead only received the equivalent of an elementary school education from various tutors and a local school operated by an Anglican clergyman. Facilitated by his family connections, he was appointed as an official surveyor for the colony's Culpeper County at the age of 17, and was later appointed by Governor Dinwiddie as Major in the Virginia Colonial Militia, where he began his military career. As a successful planter and an owner of plenty of land and property, Washington became a leader in the social elite in Virginia by his 40s, and he also became much more politically active during the same period. After the colonies decided to demand their independence from the British and subsequently go to war with what was among the most powerful militaries in the world, they urgently needed a capable General to serve as their commander. Washington's prestige, military experience, patriotism and his Virginia background made him an ideal candidate to many. In June of 1775, Washington was appointed to the roles of full General and Commander-In-Chief of the newly established Continental Army. 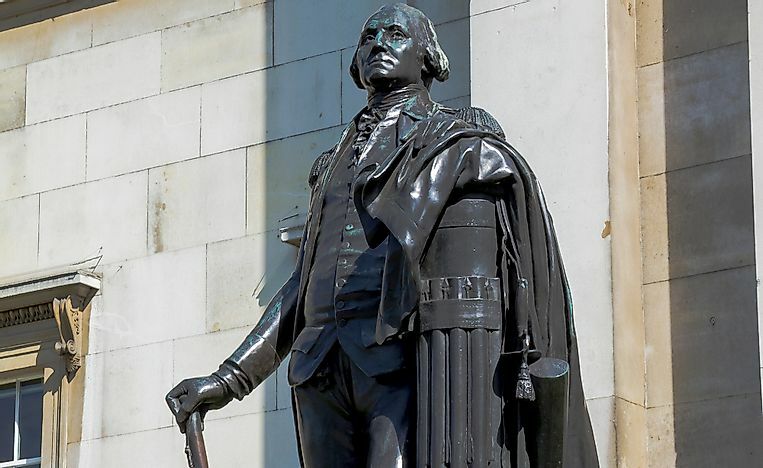 After winning the war and helping to secure independence for the United States in 1783, Washington was elected as the first President of the newly established country in 1789, and he was elected again to the same role in 1792. As the first President of the United States, George Washington set precedents in his functions of governance that proved to be integral to establishing democratic principles within the new nation. These functions included sending direct messages to Congress, establishing the Cabinet within the Executive branch of government, and practicing tolerance in regards to dissenting opinions and voices. He also adopted a series of fiscal measures that successfully resolved the escalating debt crisis, and established the nation's finances on a solid basis. During his second Presidency term, Washington also greatly expanded the American territories' bounds westward. Growing partisanship soon threatened the fragile federal government. Many important figures of the founding fathers, including Thomas Jefferson and James Madison, were opposed to Washington's Secretary of the Treasury, Alexander Hamilton, and his financial plans, and eventually established their own party, which they then called the Democratic-Republican Party. Hamilton and Washington, on the other hand, were known as 'Federalists', though Washington himself chose to not be classified as a party member. Disagreements between the Democratic-Republicans and Federalists revolved around issues over the federal government's powers' and policies' extents. By the end of Washington's second term, the two parties had been solidly established upon opposing grounds, much to Washington's dismay. Washington died at his Virginia home at Mount Vernon on December 14th, 1799 at the age of 67. He died of severe inflammation of the structure of the upper airway, which was complicated by the treatment of bloodletting, which was at that time considered to be an acceptable medical treatment that released and purged bodily ills. As early as 1778, George Washing was lauded as the "Father of his Country", and is often considered to be the most important of the Founding Fathers of the United States. He is considered not only a military and revolutionary hero, but also a man of great integrity, and a great politician. He features prominently on many monuments in the US and abroad, and his image is still found on the US one-dollar bill, quarter-dollar coin, and sculpted into the face of Mount Rushmore.